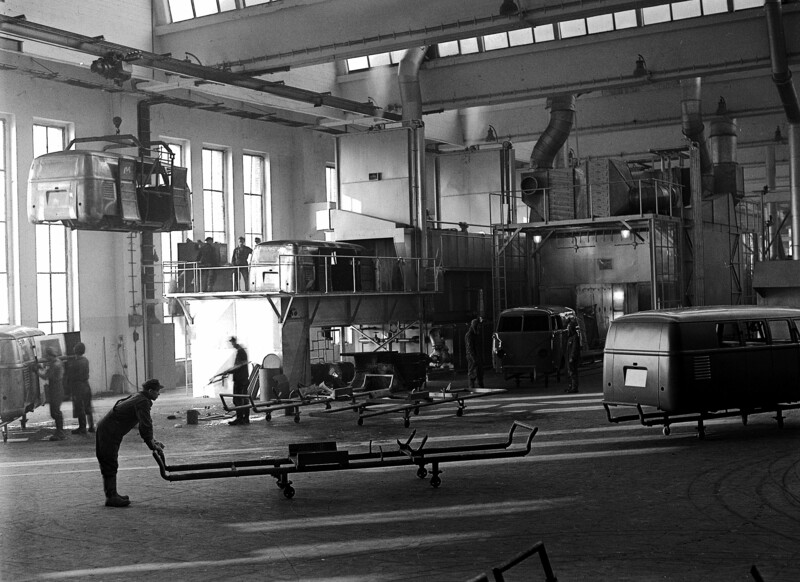 Volkswagen Transporter production in Wolfsburg, 1950. Photos courtesy Volkswagen AG. It began with a simple idea, sketched on notebook paper by Dutch Volkswagen importer Ben Pon in 1947. Inspired by the Plattenwagen, a flatbed factory hauler built from the wartime Kuebelwagen, Pon imagined a Beetle-based bus that could meet the needs of commercial customers and consumers alike. The result was the Type 2 Transporter, which entered production on March 8, 1950, and remains in production (entering its sixth generation) for global markets today. Two years after Pon’s notebook drawing, the first prototypes were completed. The initial four Transporters shown by then-factory-manager Heinrich Nordhoff in 1949 included two panel vans, a bus and a Kombi, a model with removable rear seats for hauling passengers or cargo. Nordhoff was well aware of the needs of buyers in postwar Germany, saying, “These vehicles won’t be handled with kid gloves, rather they will be treated roughly and recklessly.” The Transporter, or Type 2 as it became known, would need to be both simple and sturdy to meet these expectations. Underpinning the various Transporter models was a unitized body mounted on a ladder frame, powered by the Beetle’s proven air-cooled, horizontally opposed four and using the car’s axles. The 1,131-cc engine produced a modest 18 kW (24.1 horsepower), but that was considered sufficient to haul up to eight passengers or 750 kilograms (1,650 pounds) of cargo, albeit slowly. Priced at 5,850 DM (then the equivalent of about $1,395), the Transporter proved to be an immediate hit with tradesmen and retail customers, quickly becoming an essential part of Germany’s postwar economic growth. 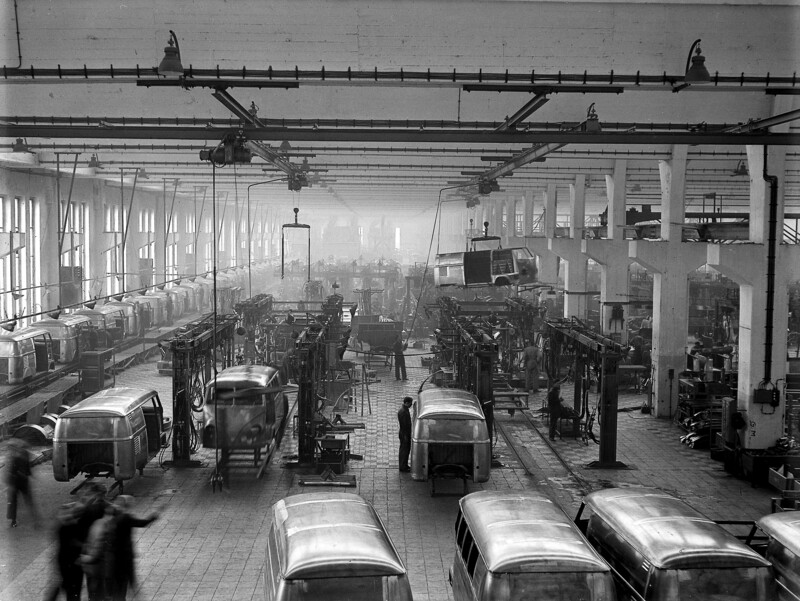 Initial production at Volkswagen’s Wolfsburg plant was limited to 10 units per day, but by the end of 1950, improved efficiencies allowed the automaker to achieve a total output of 8,001 Transporters. In 1951, a Transporter with a camper body was shown at the Berlin Auto Show, adding to the bus’s commercial success and model range. Four years after production began, Volkswagen built its 100,000th Transporter, and by then the product portfolio had expanded to include 30 different variants for the domestic market. 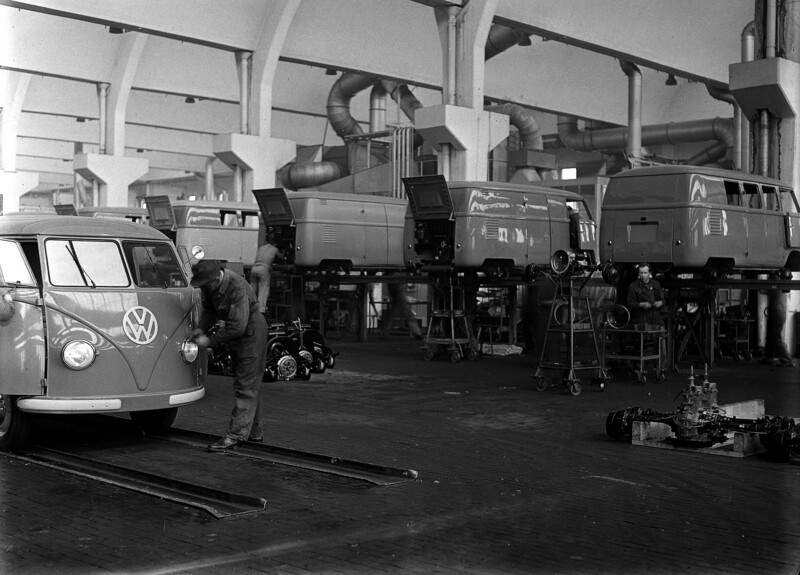 Though demand continued to grow, production in Wolfsburg (which also assembled the Type 1 Beetle) was capped at 80 Transporters a day, forcing Volkswagen to break ground on a new factory, in Hannover-Stoecken, in March of 1955. 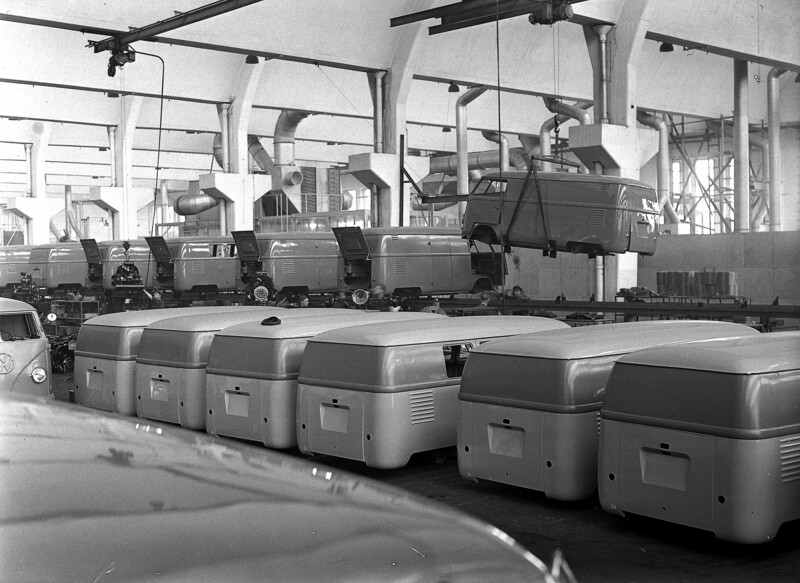 One year later, in March of 1956, the first Gemacht im Stoecken Transporters rolled off the assembly line. 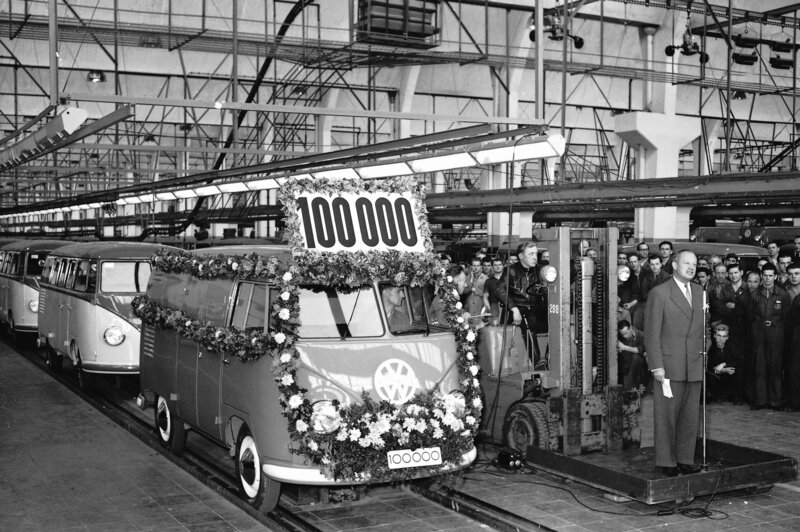 The 100,000th Transporter rolls off the Wolfsburg assembly line, 1955. In the United States, the Volkswagen bus remained a common sight on dealer lots through the third generation (sold from 1979-1991) and into the fourth (introduced in 1993). Slowing demand and rising costs saw fewer and fewer Eurovans (the North American name for the fourth-generation Transporter) on these shores, although Winnebago did build a mini-motorhome on the platform from 1995-2003. Even as sales declined in the United States, they remained relatively steady in Canada and Mexico, but by the time the fifth-generation Transporter was launched in 2002, U.S. and Canadian customers no longer had the option of buying one. Later, VW would test the family hauler waters again with the Volkswagen Routon, a rebadged Chrysler RT platform minivan introduced for the 2009 model year. It was not a success. In 2015, Volkswagen will introduce its sixth generation Transporter, now built in both Hannover-Stoecken and in Poznan, Poland. As with the Amarok pickup, the Chicken Tax (a 25-percent tariff on imported light trucks) means the latest generation likely won’t be imported into the U.S., either.